Here is our state-of-the-art Point Of Sale system ideally suited for small businesses anywhere. A single TouchScreen handles all of the operations! Click here for more pictures. The system is built on highly reliable platforms such as ELO and Ingenico. The software is based on the Microsoft .NET technologies. 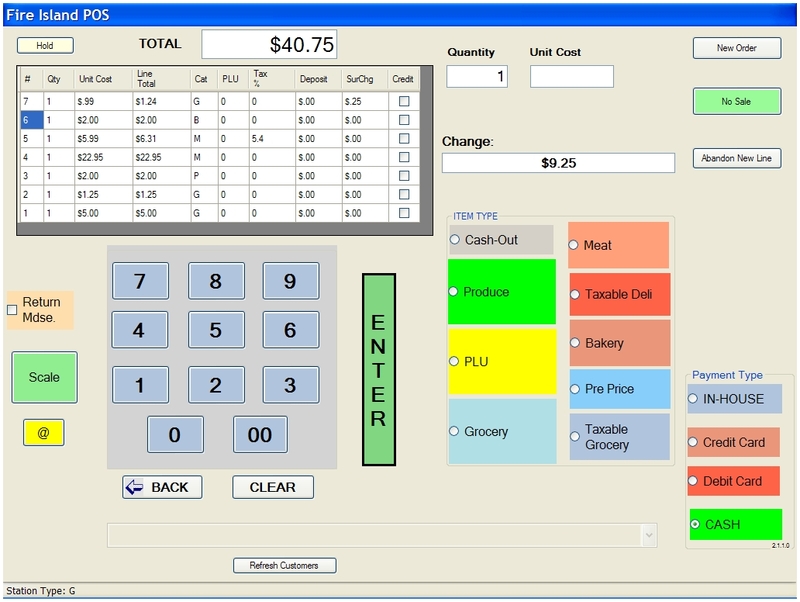 The checkout TouchScreen is simple and easy to learn, yet it performs all of the operations for checkout, receiving payments, and returning merchandise. It contains a display of the line items in an order, along with miscellaneous charges such as tax, deposit and surcharges. The system is designed for any over the counter sales stores. It includes barcoding and an extensive database of UPCs. It's unique feature is that it allows 'house accounts', where a known customer can simply sign for a purchase at the time of sale. FIPOS has a database of in-house customers who may charge purchases based on a signature and/or a PIN. These in-house charges accumulate until the bill is paid by cash, check, or credit card. If the credit card is on file, the customer's bill is paid automatically: These charges are rolled up on a weekly basis, and each customer is charged his balance in a fully automated series of transactions over the Internet. It takes only a few minutes to charge hundreds of customers. What do you gain? Increased cash flow for the store, less administrative time, less overhead in collecting bills and accounting for payments, and no time running to the bank. Here is a variation of the system working on a touchscreen tablet computer: This is the most mobile, portable POS system anywhere!